When I had my previous guinea pig, each time I went to a pet store I would buy a little something extra for him. My friend Doug and I were buying hay for our furry friends and I saw a huge clear ball for rolling around in. “Save your money,” Doug advised, “guinea pigs don’t like them.” “But what if he’s the one-in-a-million guinea pig who does?” I questioned. So I bought it and my first guinea pig (God rest his soul) sat inside the clear ball like a ball himself. Now I have a repository for spare change. When I got Princess Piggy Poo, the clerk at Andersen’s Pet Store told me that they don’t even sell those balls for guinea pigs because it’s harmful, as their bodies aren’t made for that type of activity. So Princess Piggy Poo was spared that humiliation. On another trip to the pet store with Doug to buy bedding, I saw a guinea pig harness and leash. I thought it would be fun to walk my guinea pig. “Save your money,” advised Doug, “guinea pigs don’t walk on a leash.” “But what if I have the one-in-a-million guinea pig who does?” I asked. 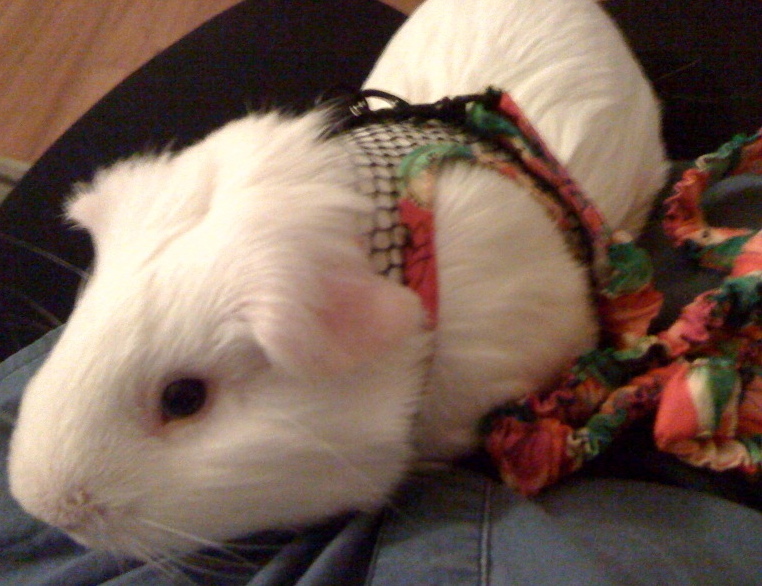 So I bought the leash, put it on the guinea pig and he sat while I dragged him around the living room for a few seconds. The harness and leash went back into the packet and put into a closet. The other day I ran across the harness and leash. I walked away and then had a thought, “What if Princess Piggy Poo is the one-in-a-million guinea pig that likes to walk on a leash?” I went back to the closet. Princess Piggy Poo didn’t seem to mind trying on the harness, but once I attached the leash, it was déjà vu. She sat on the living room floor and I dragged her a few seconds. Then suddenly she took off and ran under the couch. I had a glimmer of hope. If she was okay walking while wearing the contraption, maybe she would learn to like it. While visions of us strolling the boulevard flashed in my head, I dragged Princess Piggy Poo from under the couch and like a little Houdini she escaped the harness. Thank goodness we were in the confines of the living room and not the great outdoors. While I may think my guinea pigs are one-in-a-million, seems the only reason they are, is because they’re mine.